If you're interested in running Mac OS X, but you don't want to pay ridiculous prices for a normal Mac, then a Hackintosh just might be for you. 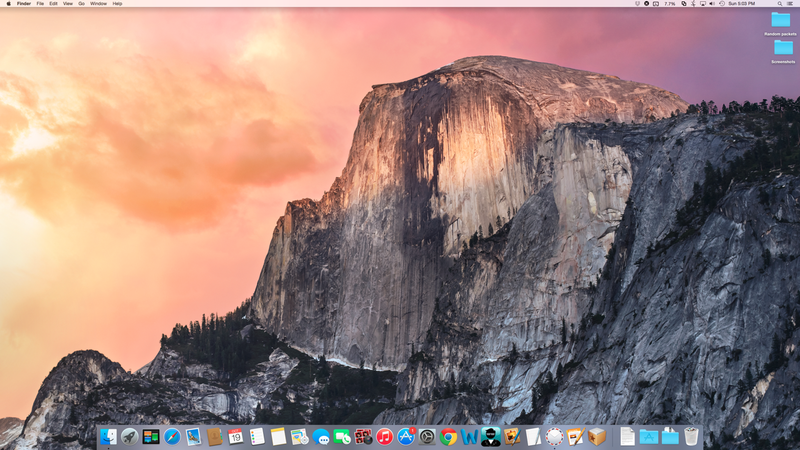 Right now, the newest iteration of OS X is 10.10, known as Yosemite. 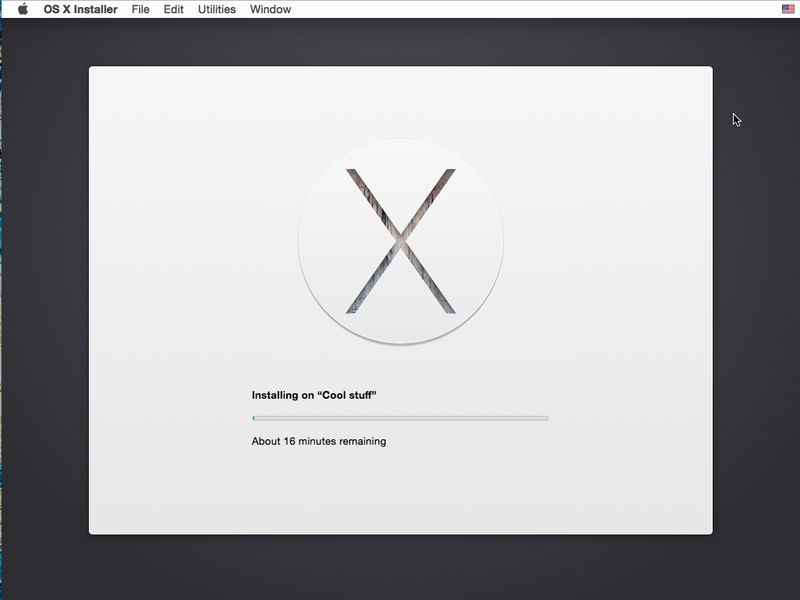 Installing Yosemite on a PC is pretty much the exact same as installing Mac OS X 10.9 (Mavericks). This guide will follow tonymacx86's standard Unibeast method, except that we try to cover the process with more detail (and pictures!). 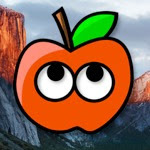 A compatible computer: Not every computer will work with Mac OS X, even with the help of tools like Unibeast and Multibeast. Be sure to read the Hackintosh compatibility guide very carefully, to check whether or not your computer qualifies. The hardware requirements for OS X Yosemite are identical to those for OS X Mavericks; AMD processors and older 32-bit Intel processors (such as Pentium M) are not supported. If your computer already has OS X Mavericks installed, Unibeast will just update Mavericks to Yosemite normally, without deleting any of your apps or files. A separate hard drive: Mac OS X needs its own hard drive (a minimum of 10 GB of space is required, but at least 50 GB of space is recommended). Unibeast will not work on a hard drive where Windows was installed first. You can bypass this requirement by applying the MBR patch to Unibeast (the process for Yosemite is the exact same as for Mountain Lion). 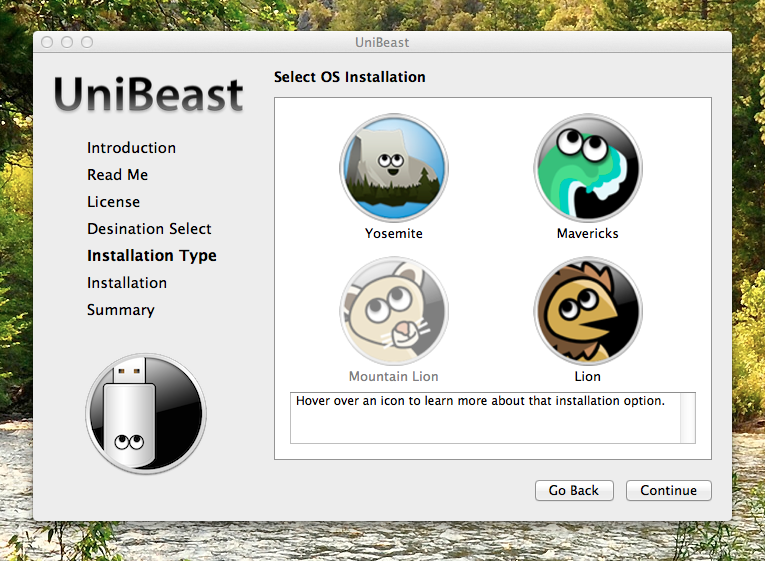 Unibeast (Free): Unibeast is a Mac program that modifies the official OS X Yosemite installer, and writes it onto a USB drive. You can then use this Unibeast USB drive to run the Yosemite installer on a PC. 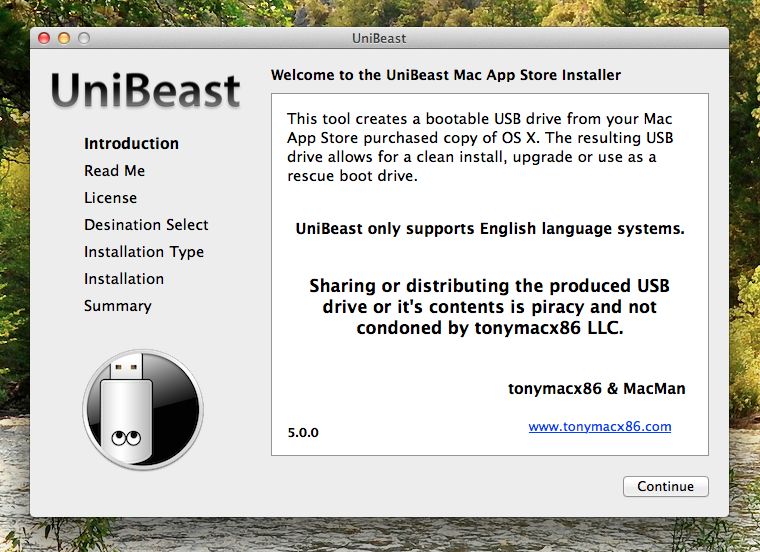 Unibeast works with Mac OS X Snow Leopard and newer; registration on tonymacx86.com is required to download Unibeast. A Hackintosh with Snow Leopard/Lion/Mountain Lion already installed, a real Mac, or a Mac OS X virtual machine: Unibeast is a Mac app, so you need a computer with Mac OS X to run it. 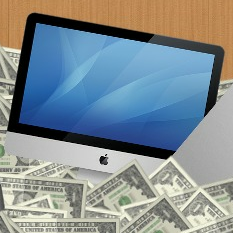 You could use a real Mac, if you own one. Alternatively, you could install Mavericks on a virtual machine, and run Unibeast on there instead. 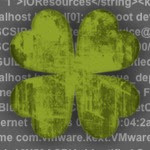 Be sure to install the Virtualbox Extension Pack to view USB drives from your virtual machine. 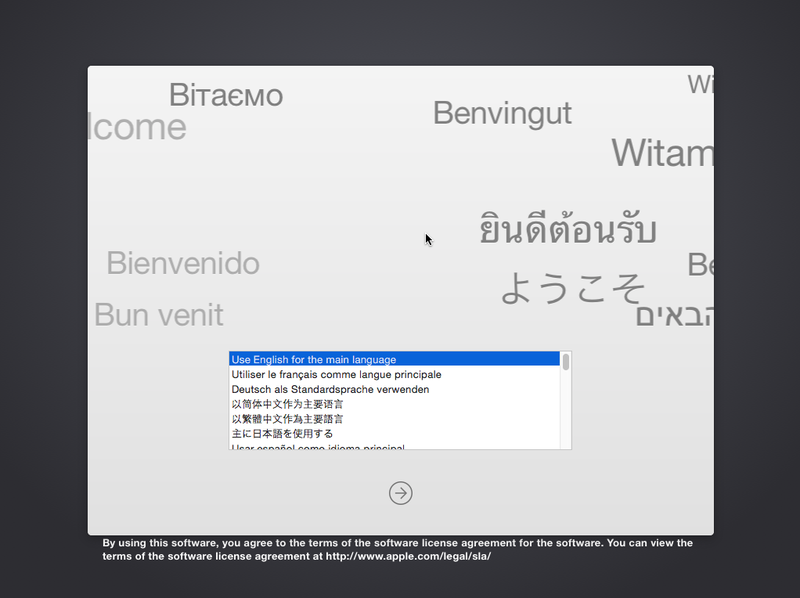 OS X Yosemite (Free): The method used by this guide requires that you download a free copy of the Yosemite installer app from the Mac App Store. Though the Mac App Store is included in Mac OS X 10.6.6 and newer, you have to be running at least 10.6.8 to download Yosemite. An empty USB drive (8 GB or larger): The USB drive used for Unibeast must be at least 8 GB in size. 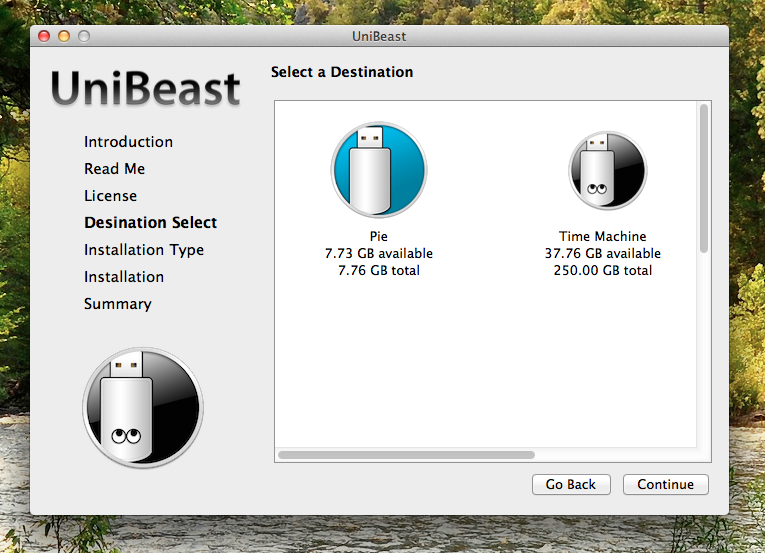 Since Unibeast will erase all of the files on your USB drive, make sure to back up its contents first. You can reuse this USB drive for normal stuff after you finish installing Yosemite. 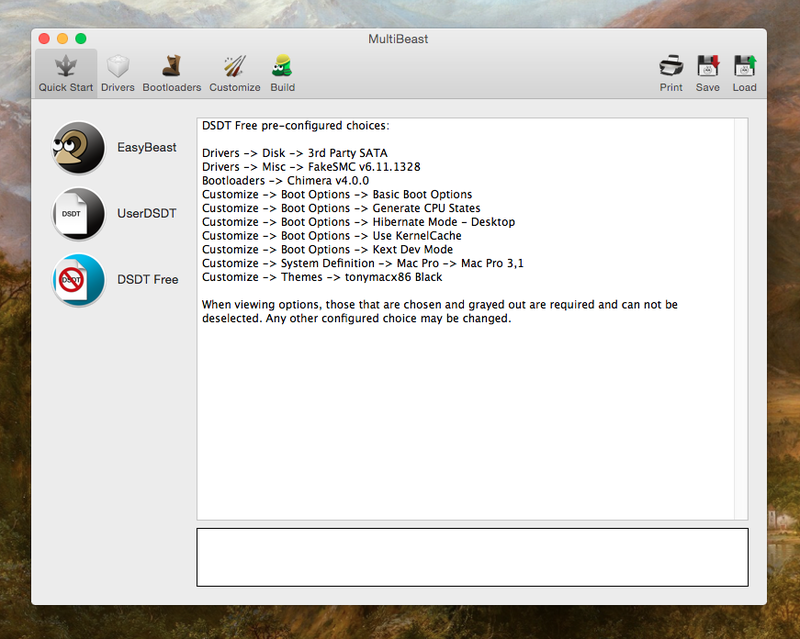 Multibeast (Free): Multibeast is a collection of kext files that your Hackintosh will need to run properly, after the initial installation. Download it onto a USB drive. Be sure to download the newest version 7 of Multibeast, not any of the older versions. Plug your USB drive into Mac OS X, and open Disk Utility (located in the Utilities folder in the Applications folder). 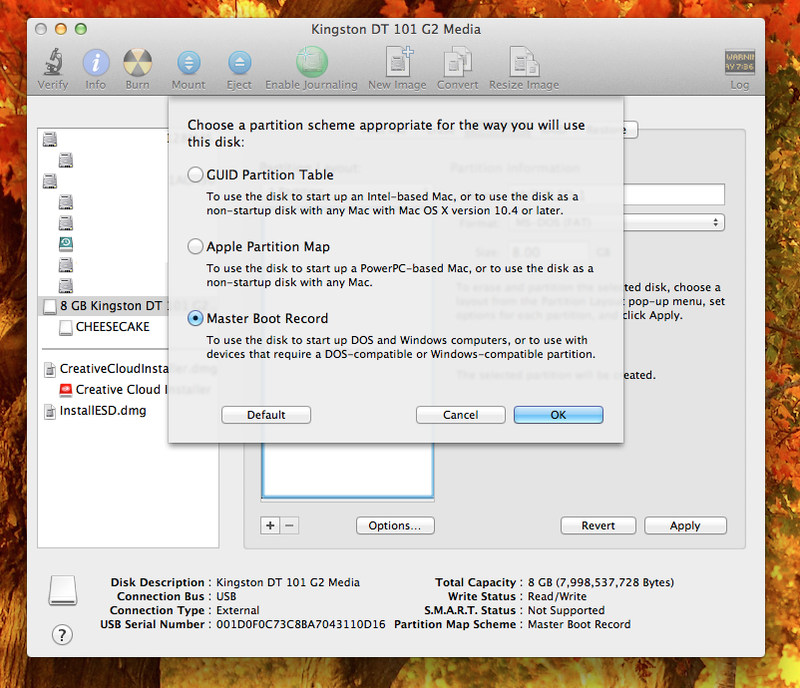 Select the USB drive in the sidebar of Disk Utility, go to the "Partition" tab of Disk Utility. Click the "Options" button, and check the partition scheme: it should be set to "Master Boot Record" by default. 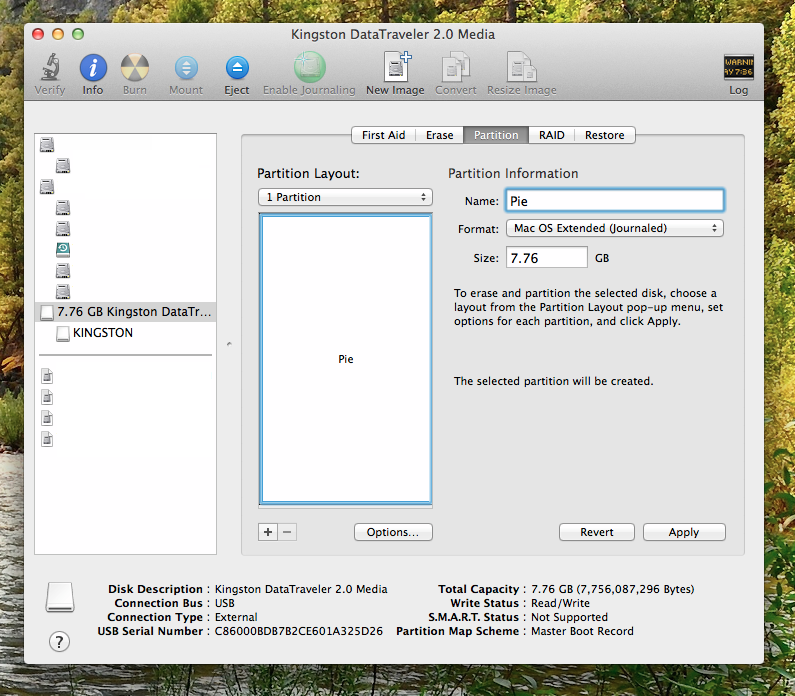 Then, create a new partition layout with 1 partition. Set the format to "Mac OS Extended (Journaled)". Name the new partition whatever you want (I named mine "Pie"), and click "Apply". This will erase and reformat your USB drive so that it's ready for Unibeast. The process should only take a few seconds to complete. Download Unibeast and run it. Make sure that the OS X Yosemite installation app from the Mac App Store is inside your "Applications" folder of Mac OS X. Select your USB drive as the installation destination (mine is named "Pie"). Click through the pages in the Unibeast installer, until you reach the following selection page. Choose the "Yosemite" option. Click to the next page. There will be two extra options you might want to select: Select "Laptop Support" if you're installing Yosemite on a laptop. Select "Legacy USB support" if you use a first-generation Intel Core processor; these are Intel Core processors with 3-digit model numbers, such as the Intel Core i7-960 or i7-875K. If neither of these options apply to you, simply click "Continue". You'll come up to the installation progress bar. 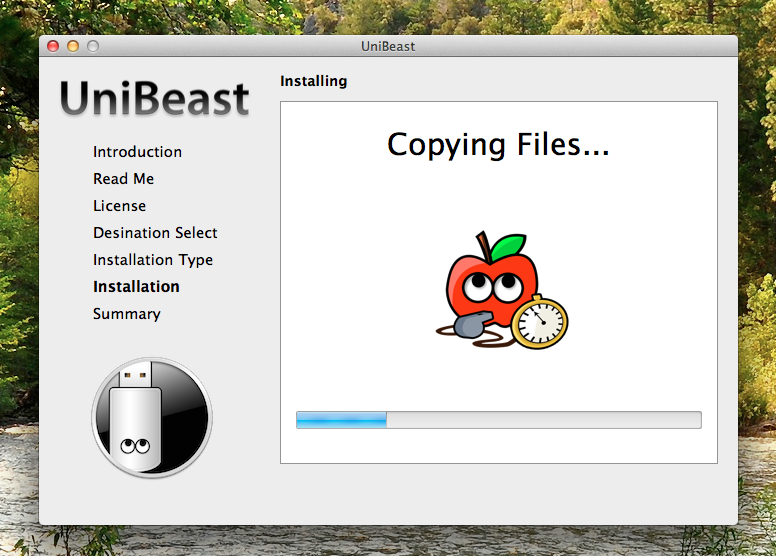 During this time, Unibeast will write the Yosemite installer app onto your USB drive, and perform a few necessary modifications to make the USB drive bootable on PCs. Just sit back and relax. Though Unibeast is supposed to only take 10-15 minutes to run, it may take up to an hour, depending on how fast your USB drive is. If your computer uses a discrete (separate) graphics card, unplug that card from your computer motherboard and use the integrated graphics on your CPU instead (assuming your CPU actually has integrated graphics). Doing this will reduce the number of possible points of failure in the guide-- Mac OS X tends to have a lot of problems with discrete graphics cards during the setup process. If possible, connect your monitor to the DVI port of your computer's integrated graphics. The Mac OS X installer sometimes has problems with HDMI and VGA. NOTE: If you're installing Mac OS X on a computer that already has Windows installed on a separate internal hard drive, you may have to enable AHCI for Windows beforehand. Otherwise, Windows won't boot afterwards. Also, after installing Mac OS X, you should also sync your clock on Windows with Mac OS X. 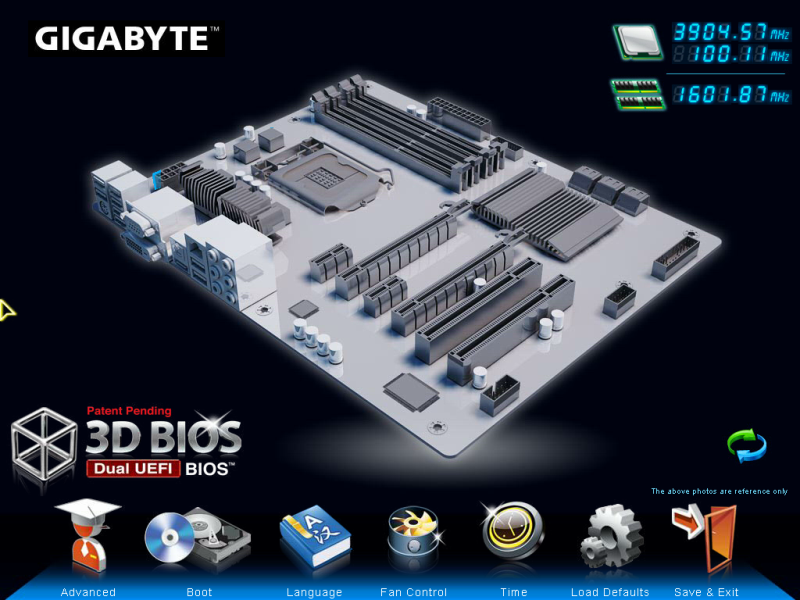 Essentially, the BIOS (or UEFI) is the settings page for your computer's motherboard. From here, you can fiddle with how your computer hardware works-- it's often necessary to change a few basic settings in the BIOS or UEFI to get Mac OS X up and running. The BIOS standard is generally used by motherboards from before 2012, while the UEFI standard is used by motherboards made after that. Not sure whether your computer's motherboard uses BIOS or UEFI? Here's a quick guide to differentiating between the two: the interface of BIOS is usually monochrome and entirely text-based. Meanwhile, the interface of UEFI usually has pictures, and allows you to use your mouse pointer. Set USB drive to the highest boot priority. If your CPU supports VT-d, disable it. If your system has CFG-Lock, disable it. If your system has Secure Boot Mode, disable it. If your system has OS Type, set it to Other OS. Once that's done, plug in your Unibeast USB drive in your computer, and then restart your computer. If things go well, your computer will now boot from the Unibeast USB drive instead of booting from your normal hard disk. You will then be able to view the Unibeast boot menu. If you do not manage to reach the Unibeast menu, check your motherboard's BIOS settings to make sure that the changes you made in Step 4 were properly applied. If they were, but you still cannot boot from the Unibeast USB drive, unplug your USB drive, and go back to Step 1. Reformat your USB drive with Disk Utility and try again. If all else fails, try using a different USB drive for Unibeast. 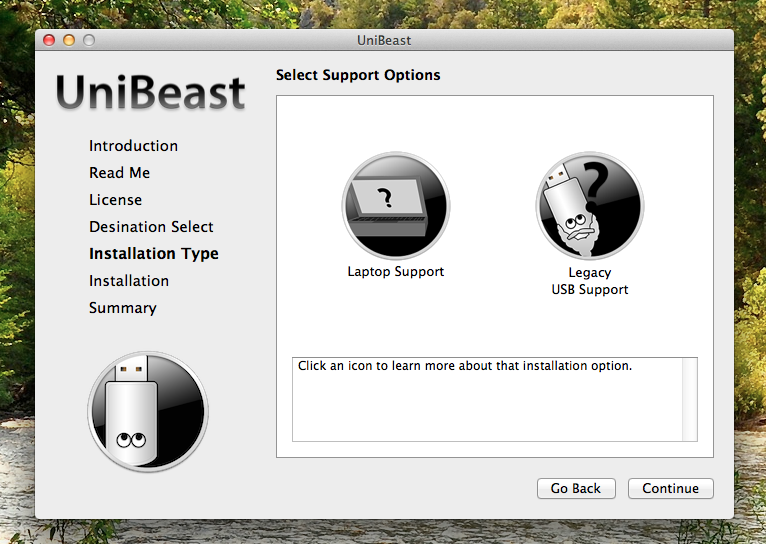 At the Unibeast menu, select the name of your Unibeast USB drive, by using the left/right arrow keys on your keyboard, and then press the enter key (or return key) to start the OS X Yosemite installer. In the worst case scenarios, instead of loading the Mac OS X installer, you may end up at a dark gray screen that tells you to restart your computer (a kernel panic), or you may end up with a small crossed-out sign (a loading error). If you get a kernel panic/loading error (or if the Mac OS X installer simply won't start within 10 minutes), you'll need to enter some boot flags. To enter boot flags, manually restart your computer by pressing your computer's power button. Then, once you've booted back into the Unibeast menu, try typing any necessary boot flags before pressing the enter/return key. Check out our list of common boot flags and our guide to fixing boot problems with verbose mode for reference. 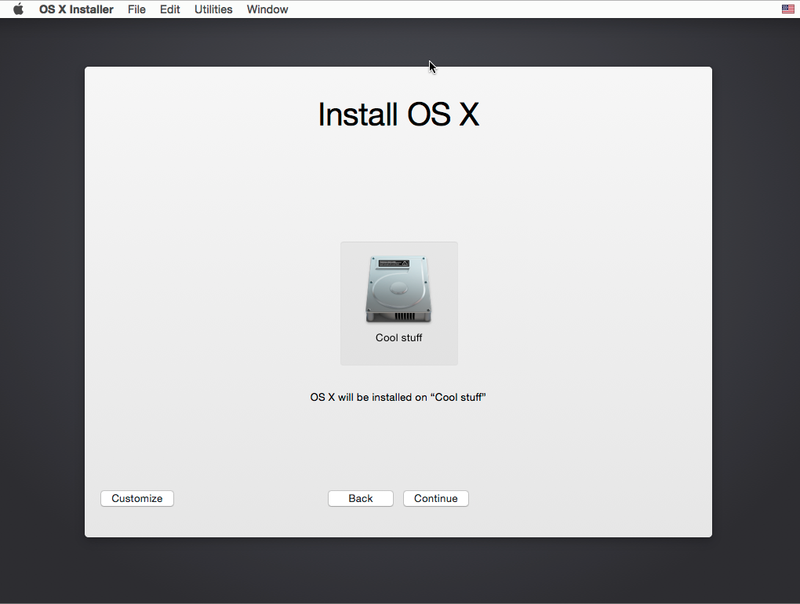 Continue, and you will eventually come up to a page that asks you where you want to install OSX. If you're installing Yosemite on an empty hard drive, the hard drive selection box will be blank. You'll have to erase that hard drive with Disk Utility first (check out Step 4 of our Snow Leopard installation guide for more details). Otherwise, if you're just updating your existing Hackintosh to Yosemite, choose the hard drive partition where you want to install Mac OS X (mine is named "Cool stuff"). Yosemite will now install itself. This will take at least 30 minutes. Restart your computer, and keep the Unibeast USB drive plugged in. 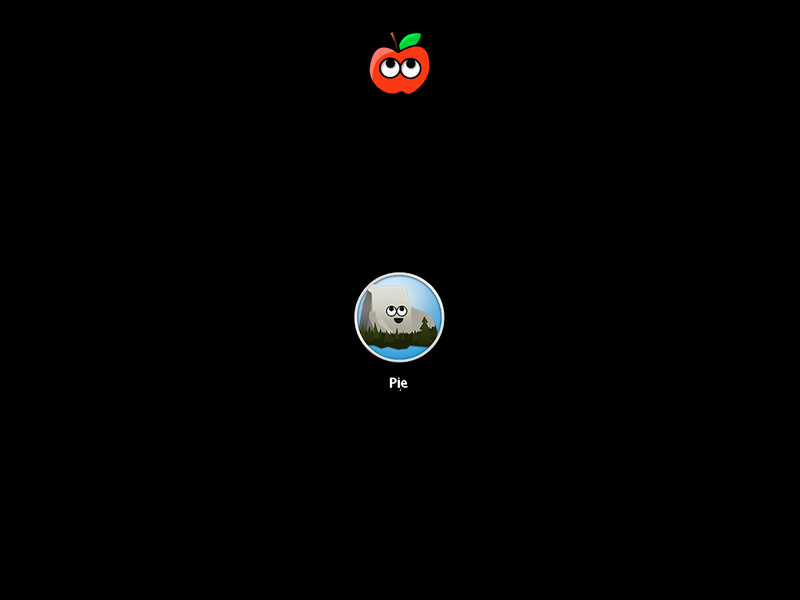 At the Unibeast boot screen, you'll see an icon for the hard drive where you installed Yosemite. Select it (use the arrow keys on your computer) and press "Enter". If everything works properly, then Yosemite will boot. Mission accomplished! Once again, if you get a kernel panic/loading error when you try to boot your new Yosemite installation (or if the installation simply won't start within 10 minutes), you'll need to enter some boot flags. To enter boot flags, manually restart your computer by pressing your computer's power button. Then, once you've booted back into the Unibeast menu, try type any necessary boot flags before pressing the enter/return key. Check out our list of common boot flags and our guide to fixing boot problems with verbose mode for reference. Multibeast is a collection of kext files that you'll need to install for your Hackintoshes to have sound, internet, a high resolution screen, and more. Different Hackintosh builds require different Multibeast setups, though most setups are very similar. Whether you're installing Mac OS X on your computer for the first time, or just updating your computer from an older version of OS X, you'll probably have to run Multibeast after the initial installation of Yosemite. Find out what Multibeast options you need to install. 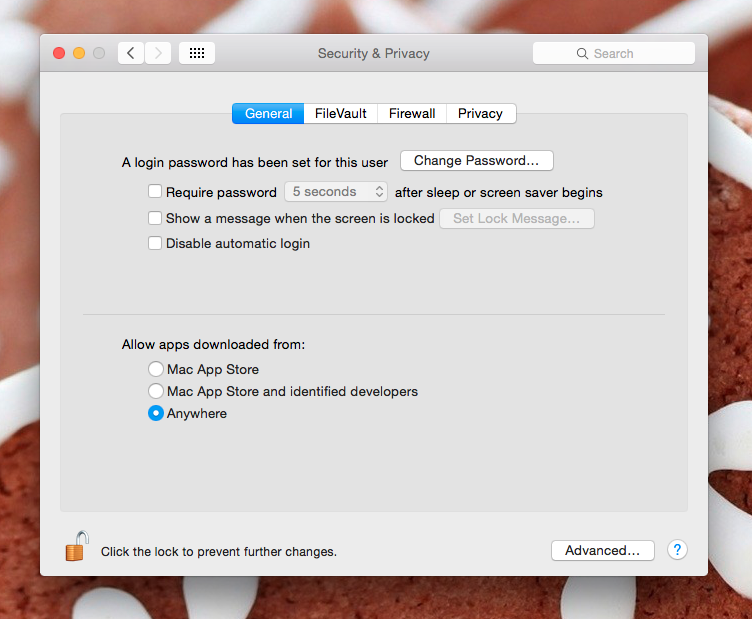 To run Multibeast in OS X Yosemite, you may have to go the "Security" section of System Preferences in Mac OS X, go to the "General" section, and check "Anywhere" in the "Allow applications" section. After running Multibeast, you'll also probably want to change your BIOS settings back to normal (from Step 4). Once that's done with, you should be running a fully functional copy of OS X Yosemite on your PC. If you plan on updating Mac OS X in the future, check out our guide to updating your Hackintosh. Congratulations!